So many interesting changes in American society—Neil Patrick Harris has had a busy year starring on Broadway, appearing in a hit film, and being chosen to head up the Oscars. Just so, he’s in the running for People Magazine’s Sexiest Man of the Year—the first for an openly gay man. On the same page, GQ magazine has named an athlete for its annual list of celebrities who have made their mark on pop culture. 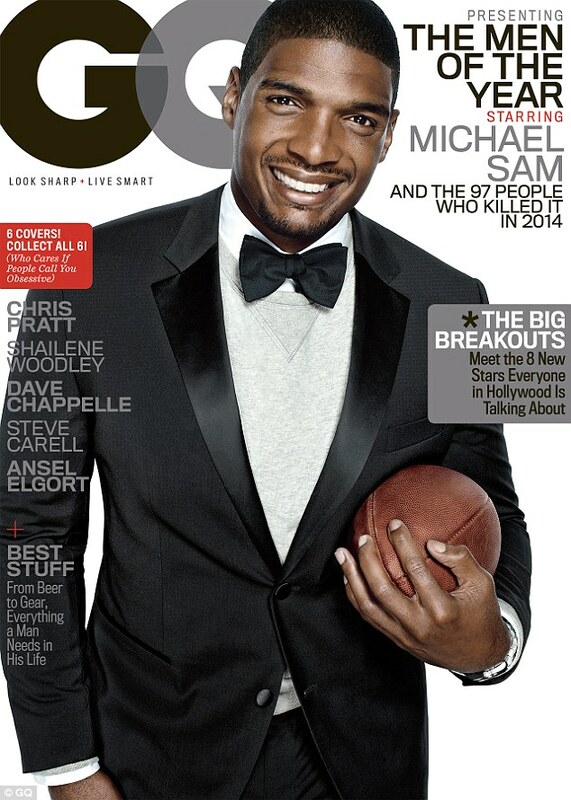 Fans ofCompete are very familiar with him—Michael Sam, the first openly gay player who gained attention in last spring’s NFL draft. He’ll be appearing on one of six GQ covers, along with Chris Pratt, from “Guardians of the Galaxy,” Dave Chappelle, and actors Steve Carell, Ansel Elgort, and Shailene Woodley. Mr. Sam was drafted by the St. Louis Rams and shot from a sports story to a cultural one when he was recorded kissing his partner in celebration. Unfortunately, we also know he was cut by the Dallas Cowboys last month and remains unsigned.